Like last year, again a sizeable portion of the LibreOffice community gathered in Brussels, for the habitual FOSDEM meetup with pretty much everyone who matters in Free and Open Source. This year, the typically badly overcrowded booths in the H building’s corridors got moved out to the newly requisitioned K building, among them the LibreOffice booth – the upside was more breathing space, the downside some required outside walk in slushy snow, and no local Coke supply. Still, I think it was a change for the better. 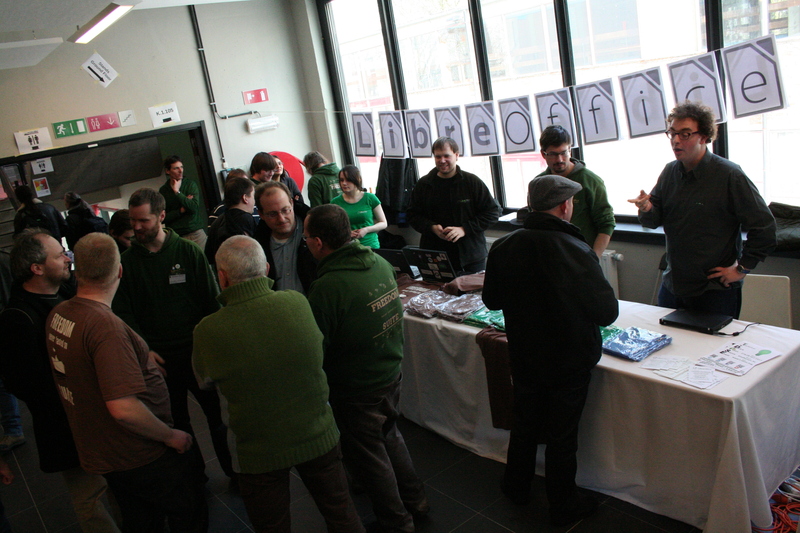 LibreOffice had a DevRoom on Saturday, which was well-attended, and stuffed to the end with talks. And Michael managed to give a record number of three gigs on a single day, plus an interview. With Cor, Jacqueline and others outfitting the booth, and Kendy again air-shipping our tshirt-supply in from Prague, we once more had a befitting presence, lots of fun, and many interesting talks.